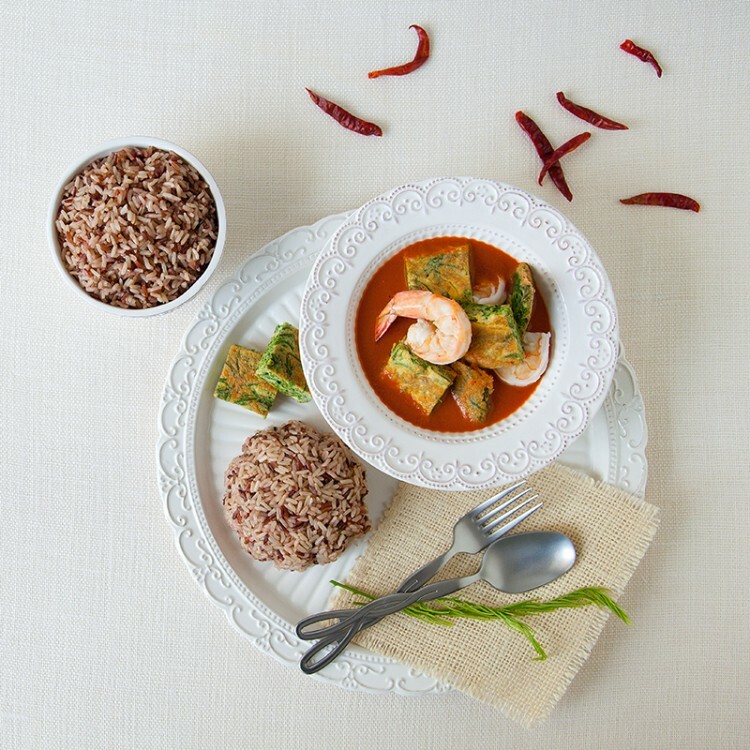 Thai sour curry or Kaeng-Som is a sour and spicy soup with shrimps, mimosa omelet. 1. To make an omelet, beat eggs with some fish sauce until frothy. In a flat skillet, add some vegetable oil and toss egg with mimosa leaves. Gradually pour the egg mixture into the pan and fry until golden on one side and flip to fry another. Transfer to a cooling rack before cut into a bite size. 2. To make sour curry, bring water to a boiling point and cook half of the shrimp. Remove shrimp from the liquid and hold the liquid in the cooking pot. Cut cooked shrimp to small pieces. Transfer shrimp to a mortar and pestle and pound shrimp to mix with sour curry paste. Dissolve the paste with shrimp cooking liquid and bring to a boil. 3. Season sour curry with fish sauce, tamarind and palm sugar. Correct seasoning if needed. Bring to a boil one more time then add shrimp. Remove from heat and pour sour curry to a bowl and garnish with mimosa omelet. Ready to serve with cooked Mixed Organic Brown Rice.